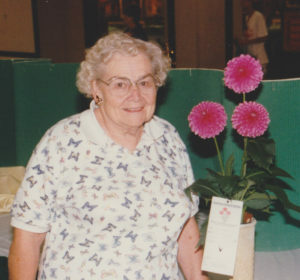 With heavy heart we need to inform the dahlia community of the passing of Nancy Moore, who for more than the past half century, was a prominent member of the American Dahlia Society. Nancy was fully one-half of the “Moore Team” along with her late husband and past president of the ADS, James C. “Bud” Moore. She passed on April 30, 2018 and not wanting to give a lady’s age, let’s simply say she was fewer than three years away from reaching that magic century mark. While she was well-known as a strong woman who backed up her dahlia man, she was also a knowledgeable and skilled gardener in her own right. Nancy was an expert in artistic floral design, teaching this art form and winning many competitions along the way. She maintained a vast storehouse of items that could become elements of her designs, regardless of the theme. She leaves her two daughters Carol and Pamela, her son James as well as grandchildren and great grandchildren. Life is easier for some than others, however Nancy exemplified the determination to lead a productive and meaningful life regardless of the circumstances. She deserves the peace she is now receiving.